Tuesday night was the second time I saw Mika; the first time was in a much bigger arena, namely the United Palace Theater. While that show was great, it paled compared to Mika's scaled down performance at Le Poisson Rouge. 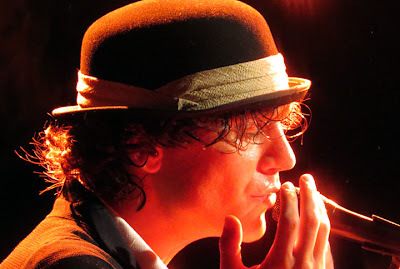 Of course, the comparison may be due to my being 4 feet from the stage as opposed to about 100, but I don't think so. I love a big production but sometimes I love a bare bones performance even more; it shows the artist and as well as their songs. 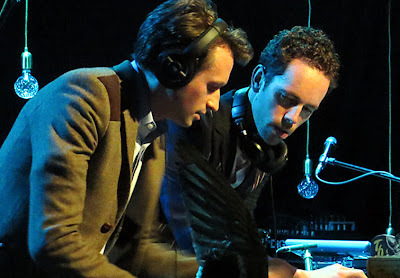 As his opening act, Mika had his two backing musicians perform a DJ set. 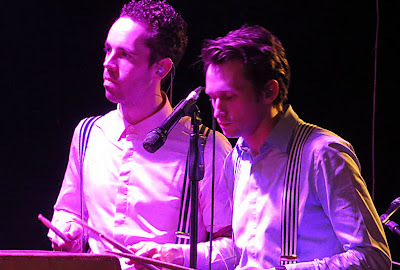 It wasn't really a DJ set, it was kind of like two guys playing cute kitsch songs and commercial advertisement soundbites for each other. They never played anything too long, they played whatever they played long enough for the audience members to laugh or sing or bop along. For example, they played the Andrew Sisters' "Boogie Woogie Bugle Boy," a voice over from a Ford commercial, "Edelweiss"" from "Sound of Music," The Chordettes -"Mr. Sandman," Lou Reed's "Satellite of Love"" and The Beach Boys' "God Only Knows." 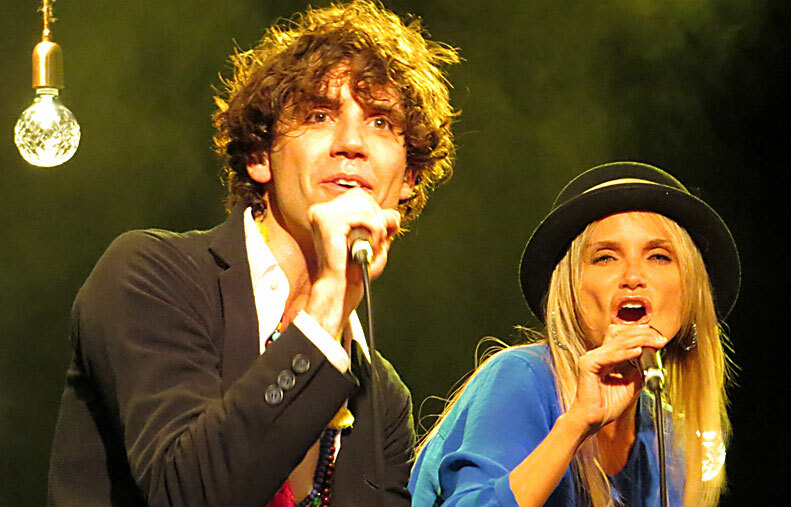 Mika later commented that when the two musicians did their DJ thing for the first time in Vancouver, that it was very strange. 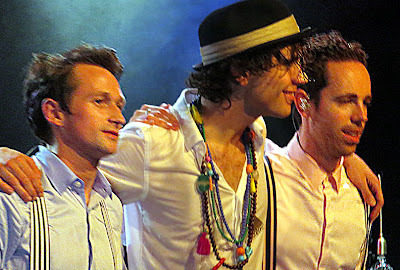 Mika said "It was like David Lynch's funeral music, ...and then they got to their second gig and it sounded like house music at Harry Potter's school" Mika ended talking about his DJs by stating that now they sounded like a cross between someone's really cool playlist and the soundtrack for the HBO show "Girls." 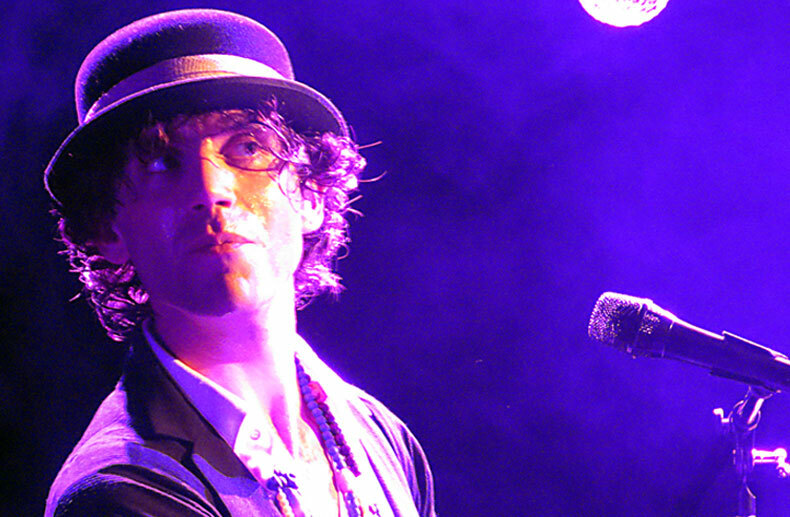 Mika walked on stage to deafening cheers from his audience about 25 minutes after his DJs finished. He played the perky piano intro to "Grace Kelly" which the audience automatically sang along with once Mika started singing. For the record, my first and lasting impression was his vocals including his falsetto sounded as good and at times even better than it does on his recordings. 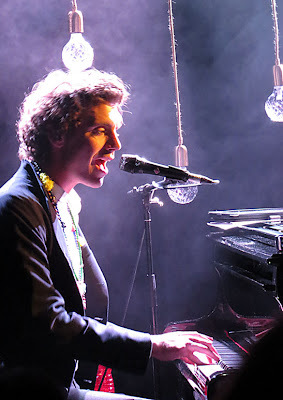 Mika performing, as part of a trio, did some really wonderful reworkings of his arrangements. 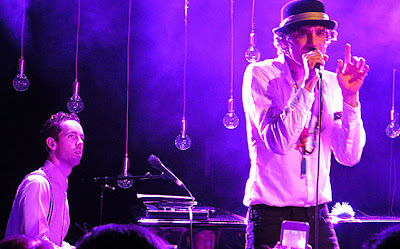 For "Lollipop," Taylor and Stansfield did an acapella do-whop kind of background part and then beat on toms from the middle of the song out. After an anecdotal tale about how the song was originally called "The Tap Dance Song," Mika had the boys drum out a tap dance beat on suitcases for the beginning of "Stuck In The Middle." Mika had a lot of fun with the audience and his band mates. During "Lollipop" an young girl was asked up out of the audience with a giant lollipop to stand by him. 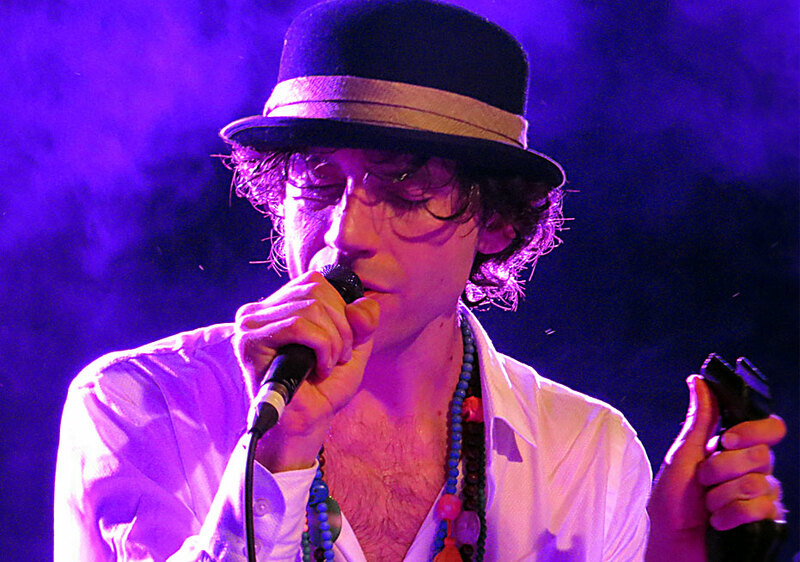 At another point, someone handed Mika a wool hat, which was kind a weird since it was the hottest night we had all spring and Mika was performing sin AC. He responded by saying "If I put this on, I'll have a cardiac arrest." 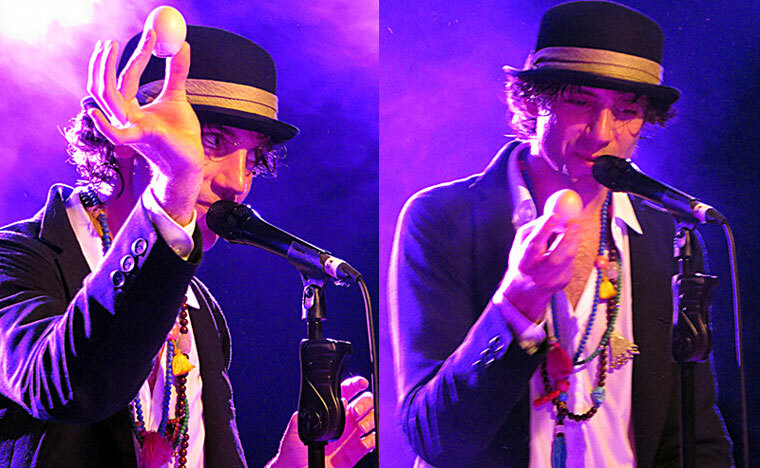 But the sweetest audience gift was an egg filled with glitter and stars which Mika broke over Stanfield's head as he played piano during "Stardust." Between "Celebrate" and "Love Today" some young woman, who was dressed up as what Mika referred to as "jewelry and stuff - super 5th Ave," kept yelling out something which was undecipherable. 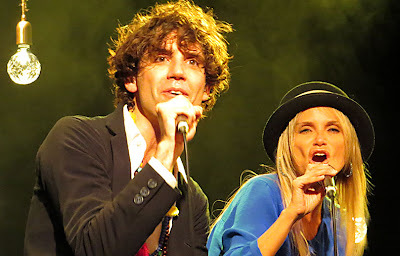 Mika couldn't help but lovingly mock the fact that she sounded like a rooster and repeated what she sounded like, except he sounded more like he was imitating a trumpet. Mika ended his set with the song "Over My Shoulder" which he said he first recorded as a demo and which he considers the beginning of his musical career. 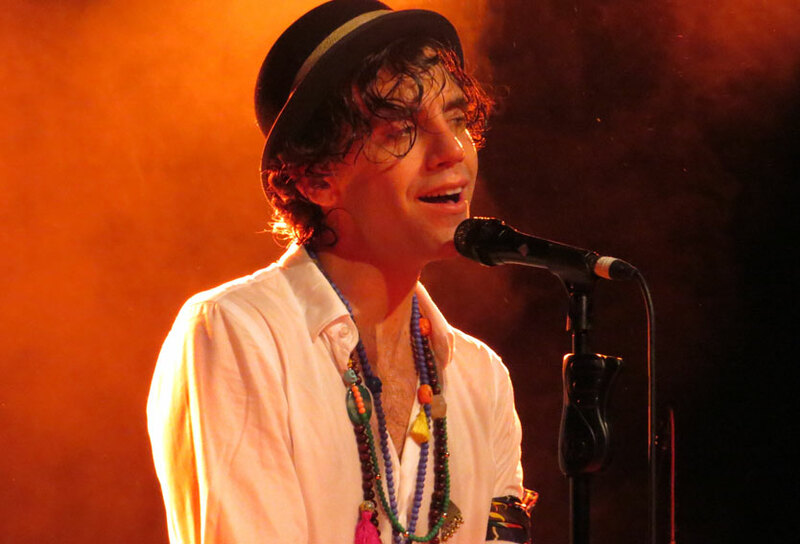 Mika didn't do an encore, he didn't have to - it was a long and fully satisfying set. 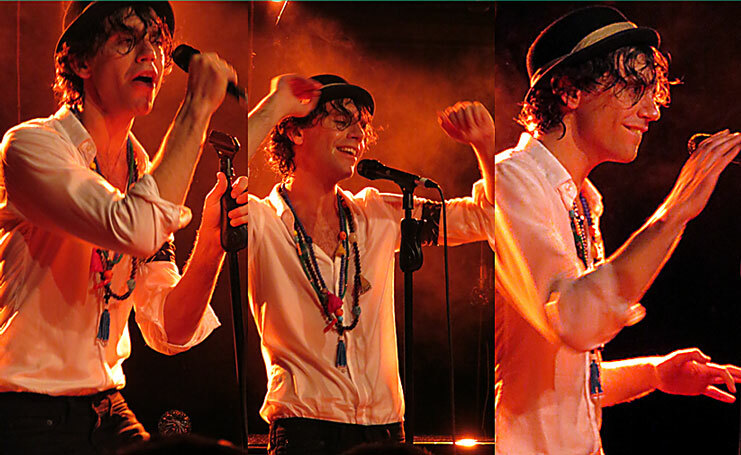 Like the star, he most definitely is, Mika knows when to leave the stage. Your photography is terrific and glad you were so close up. Nice.